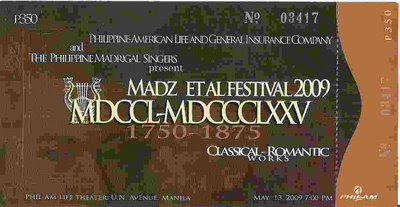 Our company choir will be singing today at the Madz et al Festival. Despite having been a choir singer for 6.5 years, this will be the first time I will attend this festival. Because I'm not a "Madz", I'm a "Korus". :D Haha. Now, now, don't start debating about whether one is better than the other. Both choirs are wonderful in their own right. A couple of years ago, the Madz brought home their second (!) European Grand Prix victory in Italy. In the world of choral singing, that's definitely a feat! And I am really truly proud of them. The Korus, on the other hand, completed their 18th International Concert Tour last year to Europe. They have been going on tour (each 6 or 7 months long) since 1974 almost regularly every 2 or 3 years! Both choirs were established at around the same time, officially about a year apart. Now just by the age of both groups, you can conclude that both have something special. Not all choirs live to be over 40 you know. With members fueled by passion for excellence, and a solid fan base (hehe), both choirs flourished in the 1970's and 80's, the height of development of choral music in our history. The Madz and Korus have very different personalities as choirs. The Madz trademark is their "sitting down" formation, and the Korus' is their choreographed choral singing. I've sung together with the Madrigal singers before (and it's always a delight), but singing with them as a Korus member of course. It's just a weird feeling to be singing in a different choir now, and then to be performing in Madz et al which is really not a Madz concert, but a Madz sponsored festival. Not to bring down my current group, I think we are doing quite well for a young choir. It's just me I guess. I keep thinking, "Am I cheating on my choir?" Gah! We've lost our internet connection at the house and I can't blog! Waah! sorry to hear about the net being down! have fun singing. don't like to sing when i am mad either, lol. you are a man of many talents it seems. Di ka na naman Chorus e.
Sir Rey, bless his soul, kept on bugging me to join Chorus. I'd always reply, "Sir, baka magalit si (conductor)"
Years later, I ditched the choir and joined the Madz. heheh. i think by now it's an accepted eventuality. i just think it's not for me. :D I had been asked before din if I was interested to join Madz by some of my madz-friends! hehe.